Can you keep water or a ball inside a bucket if you turn it upside down? Try this experiment to see if you can keep water or a ball inside the bucket without spilling it. It is best if you can do this experiment outside on a nice sunny day and if you happen to spill or splash the water it will feel refreshing and not make a mess inside. 1. 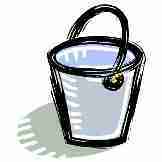 Fill the bucket a quarter of the way with water or place a ball in it. 2. Take the bucket by the handle and start spinning it around at your side from the ground, up to the sky, turning your arm behind you as the bucket makes it way back down towards the ground. 3. Keep the speed and motion of rotation the same. Does the water or ball stay in the bucket or does it spill or fall out of the bucket? If you keep the speed up and a smooth motion of the rotation going around with your arm, the water or ball will stay inside the bucket. This is due to the force of gravity pulling the water or ball towards the center of the earth as the bucket heads down and as the bucket goes up towards the sky the motion (or direction) of the water or ball is forced to stay inside the bucket (the wall and bottom) as it can not escape from inside the bucket. This is also called centrifugal force which is moving or directed outward from the center or axis..